Denmark has a long history of brewing and distilling tasty beverages, and it deserves more attention in a world growing smaller by the day. Scandinavian culture isn't well-known for its alcohol, but it should be. One of the most popular local liquors, Akvavit is a strong liquor made from potatoes and grains. 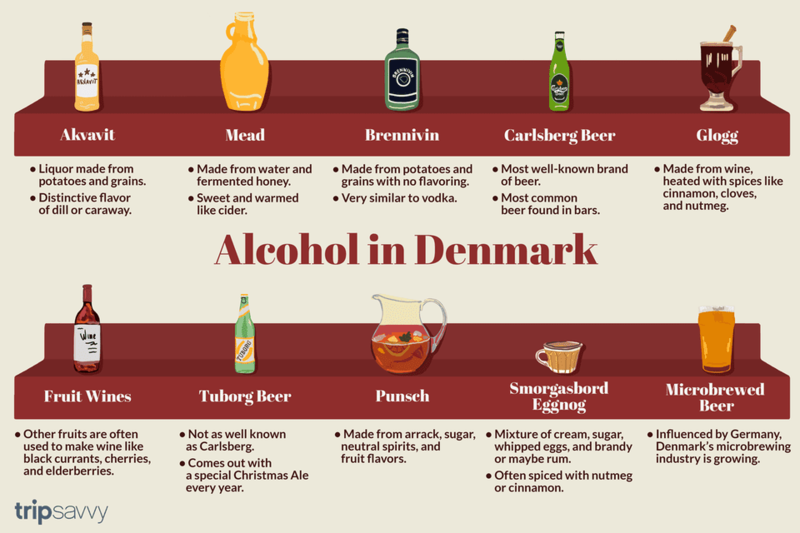 The liquor has been distilled in Denmark for hundreds of years and gets its distinctive flavor from herbs and spices, traditionally at least, dill or caraway. The name is derived from aqua vitae, which is Latin for "the water of life." Mead is one of the world's oldest alcoholic beverages. It's made from water and fermented honey, with fruits, spices or other flavors added once it's ready to drink. It's sweet, and it's delicious warmed like a cider. Unlike Akvavit, which is always flavored, Brennivin is the name of the strong brew without the flavoring. It's also made primarily from potatoes and grains, meaning that it's essentially the same as vodka, only it's vodka made the way they've been making it in Denmark since before they had the word vodka. Carlsberg is Denmark's most well-known brand of beer, and it's served in bars all over the world. The Carlsberg brewery makes a wide range of Danish pilsners, stouts and every other kind of beer available, and it's the most common house beer in local bars. Known as mulled wine in English speaking countries, Glogg is a popular drink made from wine, heated with spices like cinnamon, cloves, and nutmeg. The drink's roots go all the way back to ancient Rome, but because of how wonderful it is to drink in cold weather, it's no wonder that it is so popular so far north. Glogg is traditionally made from local wines. Grapes don't grow as well in Denmark as they do other in countries, but grapes aren't the only fruit you can make wine from. Black currants, different varieties of cherries, elderberries and other small fruits have been used by the Danish for centuries to make unique, flavorful wines. Although the Tuborg Brewery has been owned by Carlsberg since 1970, it's a distinctly different beer with its own history. Tuborg isn't the most well-known beer in Denmark, but every Christmas it's one of the best selling thanks to its yearly release of a special Christmas ale that customers wait all year for. It sounds like punch and looks like punch, but it's not punch—it's punsch. It's made from arrack, sugar, neutral spirits (like brennivin), and fruit flavors. An incredibly popular drink in Sweden, it's becoming more and more common in Denmark as people here also begin to love it. It's just like eggnog everywhere else, except with a name that's much more fun to say. Smorgasbord eggnog is a mixture of cream, sugar, whipped eggs, and brandy or maybe rum. It's often spiced with nutmeg or cinnamon and is served most often around Christmas. Remove the brandy or rum to make regular non-alcoholic eggnog. So close to countries like Germany and Belgium that are famous for their beer brewing heritage, it's no wonder that Denmark's microbreweries are growing in number and strength. Danish entrepreneurs are backing new brands regularly, and small, creative brews are becoming available in every store and pub in Denmark.